Vineet is a CFA charterholder awarded by CFA Institute headquartered in Virginia, United States. He holds a Masters degree in Finance and Control from Delhi University and a Bachelors in Mechanical Engineering from National Institute of Technology (NIT), Rourkela, India. 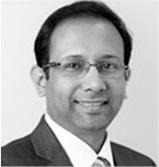 Vineet has over 14 years of experience in private equity, consulting, regulatory transactions, M&A and manufacturing. He is a Partner at Tata Capital Innovations Fund. Prior to joining Tata Capital, he was Vice President at Citigroup managed Old Lane private equity fund, with a corpus of $500 M. He also worked as an Assistant Vice President in the Transaction Advisory Services at Ernst & Young. Vineet started his career as a Junior Manager in Bhilai steel manufacturing plant and also worked as a Manager in Project Advisory & Structured Finance at SBI Capital Markets. He was responsible for private equity investment of $50 M investment in a power generation company and $ 14 M in a large infrastructure company in India. He has provided M&A advisory in one of the largest transaction in Indian Aviation and completed the most successful restructuring of electricity sector and privatization of electricity distribution in the country. Vineet is also on the Board of Vortex Engineering Pvt. Ltd.